Release your inner wildlife explorer by taking part in this safari! In the heart of the Lowveld, stretching for 352 kilometers from north to south along the Mozambique border, one of the world's foremost national parks can be found. This is the Kruger National Park, a wildlife sanctuary larger in area than Israel. Covering 19,624 square kilometers and averaging 60 kilometers in width, Kruger provides a refuge for hundreds of mammals, bird, fish, and insect species, types of trees and shrubs, and thousands of small plants. Come and explore this amazing country and wildlife with WhereTo Tours! Children policy: Children under 8 years old is not allowed on this tour and children under 16 need to be supervised. You will be accommodated at a rest camp in Skukuza. Skukuza, located 50 kilometers east of Hazyview in Mpumalanga, is the capital city of Kruger National Park as well as being the administrative headquarters and main camp of the Kruger National Park in South Africa. Accommodation at Skukuza varies from small, but comfortable, bungalows to tented. Each site has an outside braai (barbecue area). Tented accommodation shares the ablutions, cooking, and wash-up facilities. Staying at Skukuza means you are allowed to use facilities such as the swimming pools and watching free movies at the outdoor cinema. The name "Skukuza" was given by the local Tsonga people as a nickname for James Stevenson-Hamilton. It could be translated as to sweep, as Stevenson-Hamilton was perceived as to sweep the land clean of poachers and other criminals operating in the area. But according to Dr. HA Junod, an expert in Tsonga history, the name Skukuza reflects the Tsonga people's attitude and resentment towards forced removal from their beautiful and fertile land. The area around Skukuza was inhabited by the Tsonga people until 1905 when they were forcibly removed by the Colonial Government as it was decided from the beginning that if the park were to succeed, no humans could be allowed in the reserve. The rest camp benefited by virtue of being classified as a white area during the heyday of colonial and later Apartheid South Africa. As a result, the South African Government invested hundreds of millions of Rands in order to modernize and westernized South Africa's largest rest camp. Paved roads, state of the art accommodation, restaurants, Skukuza cricket club, medical suites (with resident doctors available 24 hours), safari helicopters, 18-hole golf course, conference venues, African curio shop, ATM's, a police station, staff accommodation, a primary school (Laerskool Skukuza), a church (Nederduitse Gereformeerde Kerk), indigenous plants nursery, museum, library, and the most important of them all, a modern airport known as Skukuza Airport, which has four direct flights from both OR Tambo International Airport (JNB) and Cape Town International Airport (CPT). Air link operates the flights, which can also connect neighboring airport at Kruger Mpumalanga International Airport (MQP) in nearby Mbombela. A modern hotel, Protea Hotel Kruger gate Skukuza was also brought in by the South African government in order to service wealthy tourists, mainly from overseas, but also a fairly reasonable number of South Africans as well. The South African government also brought in safari helicopters at Skukuza in order to patrol wildlife from the sky. As a result, Skukuza tops the whole of South Africa, and indeed the whole African continent in terms of infrastructure development. This five-day safari offers you five days and four nights inside the Kruger National Park where on the second, third, and fourth day you can really experience what the Kruger National Park has offered, as you will be in the park from dusk till dawn every day. Departure would be from Johannesburg, Maputo or Nelspruit areas, and pick-ups would have to be quite early on the first day to give you enough time to reach the Kruger National Park before gate closing time. You will be collected at O.R. Tambo International Airport (JNB), Johannesburg or any other destination in and around Johannesburg. You will drive along a scenic route to Numbi Gate of the Kruger National Park. You use Numbi Gate, as it is the closest gate from Johannesburg. The duration of the drive will be anything between four and five hours, it all depends on where the departure point is. You will be collected from Nelspruit Airport - Kruger Mpumalanga International Airport (MQP), or any other destination in and around Nelspruit. It is not a long drive and you will make use of any of Numbi, Phabeni, or Malelane Gates of the Kruger National Park, it all depends on the departure point. The duration of the drive to the Kruger National Park would only be between 30 and 60 minutes. Your game viewing will start as soon as you enter the Kruger National Park. After the game drive, towards the evening and before gate closing time, you will arrive at the rest camp, where you will book in and freshen up before dinner. Your day will start very early in the morning, as this is the best time to see the elusive animals of the Kruger National Park, especially lion and leopard. You will start your day with a cup of coffee or tea and rusks or biscuits (cookies), and make sure that you exit the gates of the rest camp as soon as they open. Starting your game drive, you will visit rivers, waterholes, and lookout points in the search of the Big Five, and other animals that you might want to see. You might even visit the waterhole where the famous battle at Kruger took place. As you are in constant radio contact with other open safari vehicles, you will be also asked for any updates regarding any special sightings. You will stop at a rest camp or picnic site to enjoy a scrumptious breakfast, before you carry on with your game drive and only return to the rest camp later for lunch and a short siesta. After your break and in the afternoon, you will head out for another game drive. Please note that if you prefer to stay out on safari the whole day, then you can do that. This would be your last day inside the Kruger National Park and you will again start very early with a cup of coffee or tea and rusks or biscuits. After a short game drive, you will stop at a rest camp or picnic site to enjoy breakfast, before you start heading your way to the gate where you will exit and return to your destination. Originally from the Eastern Cape where he finished his school, Steven moved to Gauteng area. This was mainly due to seeking what he loved. He ended up after nine years in the hospitality industry where he worked himself up from being a waiter to a general manager at one of Pretoria five-star hotels where he daily dealt with high profile guests. Since then, he decided to start enjoying life and was always passionate about animals. He loves to teach people about the bush, animals, and culture of South Africa. This safari will take place in Kruger National Park, South Africa. 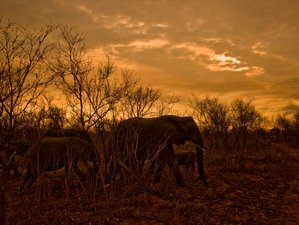 The Kruger National Park is world-renowned as are several of the luxurious private reserves on its western boundary. It was established in 1898 to protect wildlife and covers an area of two million hectares. Truly the flagship of the South African national parks, Kruger is home to an impressive number of species: 457 trees and shrubs, 1,500 smaller plants, 49 fish, 34 amphibians, 114 reptiles, 507 birds, 147 mammals, and countless insects. Apart from the irresistible magnet of this wildlife mecca, some spectacular scenery can be viewed in the mountainous area known as the Panorama Route, en route to the Kruger Park. The rest of the payment should be paid 50 days before arrival. WhereTo Tours loves showcasing their beautiful country, South Africa. They aim to give the best experience safari and to deliver the best service.